This month, I want you to think about the women and girls (and even female creatures) you encounter in your reading, both the good ones and the baddies. Which ones do you love? Which ones do you loathe? Is there a thread that links female characters together between books? Is there a certain type of character that is your favorite? Feel free to share your thoughts in any format you like. I'll have a link-up post at the beginning of the month for any posts, giveaways, artwork, etc. that you would like to share with the other participants. And remember to use the hashtag #dwjmarch on Twitter and tumblr. Speaking of, I'll also be posting again this year on the dwjmarch tumblr. Tying in with the theme, I've chosen three read-alongs with strong female characters, one a joint read with the #sffwomen reading group! Keep an eye on the #dwjmarch and #sffwomen hashtags for chat times. And, yes, Spellcoats is the third in the Dalemark series but it is first in story chronology for the series and Diana said you can read the first three books in any order you like, just keeping the fourth book for last. I hope that everyone is looking forward to this year's event! Let me know in the comments section what you think of the theme and which books you think you might read. I hope to get the Spellcoats from the library (it'll be in Dutch but I think that would still work for a readalong) and I plan to read some of the Chrestomanci books since I own the series and want to make a dent in my TBR pile (I promised no more DWJ book-buying before I read a few more of the ones I own). Could I drop my name in the hat for the Islands of Chaldea? We could get some really good posts on DWJ's hungry mothers. Shiver. Great news. I need some DWJ to charm me out of this endless winter. I'm going to leave the giveaway to others who might not own these books. Yes, it's very convenient to have this at the end of the winter. The month always seems to fly by so that will help! I really must read more DWJ! I always want to join in each year, but I never get to as much as I would like. I will try again this year! What?! How could they not have any? That's horrible news. Well, Time of the Ghost is the one I can't get hold of easily myself, so that's my top pick, but hey, I'll go with any! I'm hoping I can join in this year! Aunt Maria has been on my TBR for ages. The Spellcoats looks pretty interesting, too! Aunt Maria is such a fun one and Spellcoats will be a first for me. I hope you can join too! An exciting line up there. I love the theme. I also love the read along choices. The Spellcoats is my least favourite of the Dalemark Quartet, but I love the others so I'm glad to have a chance for a re-read and hearing everyone else's opinions. (Plus, I've only read it once, so surely I'm guaranteed to enjoy it more the second time around.) I'm looking forward to hopeful joining in with everything. No blogging for me, but I will still read along! My library has The Islands of Chaldea, so I'm up for the twitter chat on that one, and I also put Howl's Moving Castle on hold. Looking forward to them! Fantastic! I look forward to discussing them with you! I've been looking forward to this! 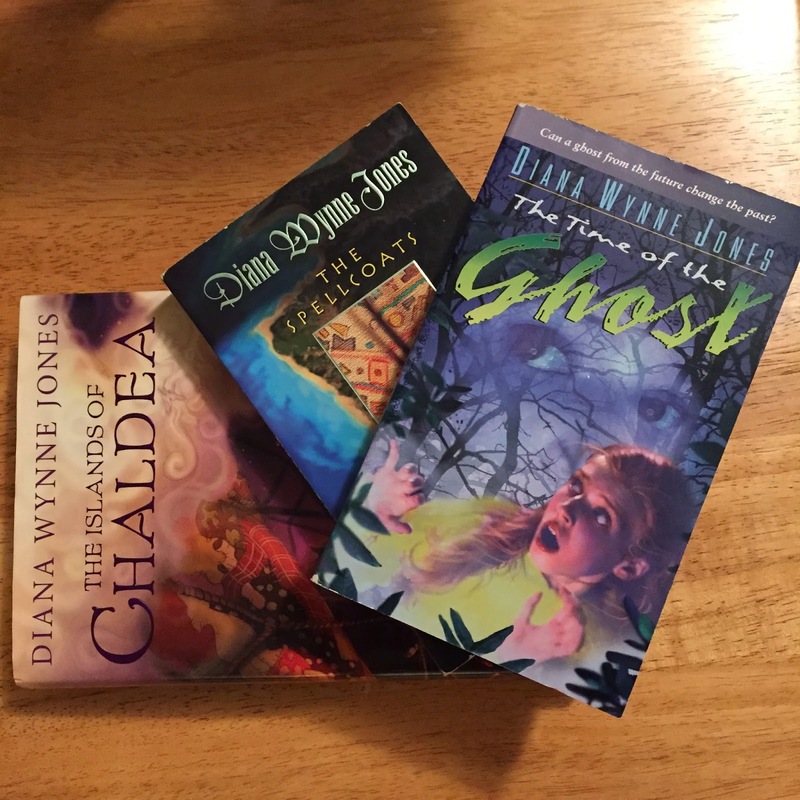 I didn't know about DWJMarch before last August, so I've been waiting for this year's :) I've only recently reread and blogged about Spellcoats and Time of the Ghost, and won't be rereading Chaldea anytime soon (being on my own DWJ reread project this year), so I won't be joining for the readalongs, but I'll be joining in any other way I can! Yay, #dwjmarch! I'm going to reread the whole of the Dalemark quartet and probably everything else as well, let's be honest.